A GAL NEEDS...: CSN Store Review and Upcomoing Giveaway Announcement! CSN Store Review and Upcomoing Giveaway Announcement! I really enjoy shopping online, for just about everything. Even if I end up traveling to the store, I use the internet to research my product of interest to become more educated on what is available out there and at what prices. CSN is a great resource to do that research because they have such a huge selection of brand names at such competitive prices that you really can't go wrong. For instance, if I was in the market for, say, bathroom vanities, I could go to CSN's main website, click on the button to view all of their stores, and on that page refer to Home Improvement. There I would find the selection for Bathroom Furniture. From there I would find an instruction link called Vanities 101. 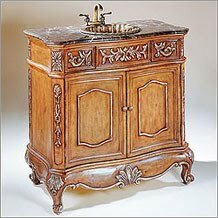 This is a valuable resource that talks about the purpose and function of different kinds of vanities, how to choose a vanity that fits your space, mirror info, do-it-yourself info, links to many name brands specializing in vanities and many other helpful tips on how to choose the right vanity for you! Or if you just want to go the simple route, just type 'Bathroom Vanities' into the search box and you will be connected to 19,845 different styles and brands of bathroom vanities! Just one example of how CSN can help us everyday! It's not just a lot of online stores (over 200, as a matter of fact), it's also a great resource for information! So I'm excited to announce my upcoming giveaway for a CSN gift card. It will be for $40 and there are so many things you can get with that. Also, there are items that are labeled 'no shipping', which is nice because you can use the whole $40 for the product! Another great resource is the e-mail notification service when a product is out of stock. Simply click 'Notify Me' and you can be notified by e-mail when that item is back in stock! So join me this week, when I open up my CSN giveaway and hopefully you'll get to experience first hand, like I have, what CSN has to offer! Sounds like a great giveaway to a great place to shop online!